What are super-massive black holes? Astronomical observations have revealed that the centre of our galaxy hosts a black hole that is about four million times as massive as the Sun. 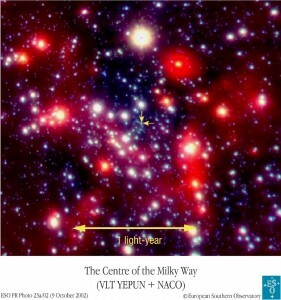 After more than a decade of work we have solid evidence of its existence, the arrow in the adjoining figure denoting the location of the super-massive black hole at the Galactic centre. Stars can be seen to orbit the seemingly empty space in the video below. Andromeda, the largest galaxy in our neighbourhood also contains a black hole whose mass is in the region of one hundred million solar masses. Indeed, probably most galactic nuclei host black holes whose mass is in the range of 0.1 million to 10 billion solar masses. Such black holes are called super-massive black holes, to contrast them with the stellar-mass black holes of mass in the range 1-10 solar masses. No firm black hole candidate in between the two mass ranges above have so far been found. Lack of black holes in this intermediate mass range has not been understood. However, ultra-luminous compact sources, which are highly energetic X-ray emitters, are supposed to originate from black holes of thousands to several hundred thousand solar masses. Black holes in this mass range are called intermediate-mass black holes. The origin of super-massive black holes has so far remained a puzzle. It is possible that initially a seed black hole of much smaller mass forms and then grows in size by slow accretion of gas. Alternatively, super-massive black holes might form together with the galaxy by the collapse of very massive stars, or might be the result of the collapse of a star cluster. Observations do not favour any particular model. Needless to say, the origin of super-massive black holes is crucial in understanding how galaxies, their clusters and clusters of galaxy clusters, in other words the large-scale structure in the Universe, came into being. Whatever the origin, it is reasonable to expect that the formation of a super-massive black hole will be accompanied by the emission of gravitational radiation, an exponentially damped sinusoid that is characteristic of the hole. Indeed, the radiation results from the quasi-normal mode oscillations of the black hole, the frequency and decay time depending only on its mass and spin. The quasi-normal mode frequency is greater for black holes of smaller mass and larger spin. For example, the fundamental mode frequency of a non-spinning, million solar mass black hole is 12 mHz and scales inversely with the mass and the frequency will be higher for black holes with greater spins. Laser Interferometer Space Antenna (LISA) will observe gravitational waves in the frequency range 0.1-100 mHz, the range in which super-massive black holes of mass 0.1-320 million solar masses emit their normal modes. By observing the normal modes LISA will take a census of black holes and measure their masses and spins. This will help us to infer the mass-function of black holes as a function of red-shift and thereby help understand the origin of super-massive black holes. Some galactic nuclei are seen to host not one but two black holes. The galaxy NGC 6240 shows two cores as revealed by X-ray observations using the Chandra X-ray satellite . 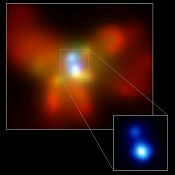 Such nuclei are believed to have been formed as a result of the collision of a pair of galaxies each hosting a super-massive black hole. Einstein’s theory of gravitation, dubbed general theory of relativity, predicts that a binary system would emit gravitational radiation. This radiation costs energy, which would come at the expense of the binding energy of the system. Thus, the two black holes at the galactic core would slowly spiral in toward each other. In fact, the emission of gravitational radiation might actually drive some of these systems to merge within the age of the Universe. Indeed, LISA is sensitive to the radiation emitted during the late stages of inspiral of a super-massive black hole binary. The two super-massive black holes in NGC 6240 will inspiral toward each other and merge in the next several hundred million years. We do not yet know how frequently super-massive black holes inspiral and merge; one of LISA’s goal is precisely to observe such events and measure the global rate of the formation and merger of super-massive black holes. The galaxy NGC 6240 shows two cores as revealed by X-ray observations using the Chandra X-ray satellite.